MMK+ wins 2nd Prize for the international Competition (Hosted by Seoul Metropolitan Government) for New Gwanghwamun Square in Seoul. MMK+ collaborated with Supermass Studio (New York), IDN Architecture, Professor Jaemo Cho and Kyowoo Engineering. MMK+가 새로운 광화문광장 국제공모전에서 2등에 입상하였습니다. 조경설계사무소 Supermass Studio(뉴욕) 와 이든도시건축사사무소, 경북대 조재모교수 그리고 교우엔지니어링이 한팀을 이루어 경쟁한결과 최종지명된 10개 팀중에 두번째안으로 선정되었습니다. MMK+는 어반트랜스포머 (노들섬 특화공간 공식 운영자)와 함께 ‘도시의 일상 속 나를 위한 작은섬’ 이란 이름으로 2018 노들축제 (with 서울시 도시재생 엑스포)에 노들섬 프로젝트를 소개하였습니다. MMK+ is invited to join International Urban Design Competition for the Regeneration of Tongyeong Dockyard hosted by Tongyeong City Government and LH (Korea Land & Housing Corperation) to compete with 6 other International Consortium teams. MMK+ is teamed with IDEN Architects, HEA (Landscape), Project Soo (Tourism), DTZ-PAC (Real-Estate). MMK+ 가 통영시와 LH공사 주최 통영 폐조선소 재생 사업 현상공모에 초청되었습니다. 이든건축, HEA 조경, 프로젝트수, DTZ-PAC 와 함께 팀을 이루어 국내 및 국외사로 이루어진 6팀과 함께 경쟁하게 되었습니다. MMK+ wins 3rd Prize for the international Invited Competition for Jamsil Parcel 5 Masterplan. MMK+ collaborated with EMA Architects, FLO Architects and Supermass Studio (New York) MMK+'s proposal will be officially released later. MMK+가 잠실5단지 재건축 국제현상공모에서 3등에 입상했습니다. EMA 건축사사무소, FLO 건축사사무소, Supermass Studio 조경설계사무소 (뉴욕)과 함께 팀을 이루어서 경쟁한 결과, 지명된 7개 팀중에 세번째안으로 선정되었습니다. MMK+의 계획안은 추후에 공개예정입니다. On April 12, 2018, MMK+ will have a special lecture at Graduate School of Design, Harvard University, hosted by KoreaGSD, sharing ideas and experiences on Nodeul Island project with students and faculties at Harvard GSD. MMK+ 가 4월 12일 하버드 대학교 디자인대학원에 초청되어 특강을 하게되었습니다. 노들섬 프로젝트의 당선부터 현재 진행과정을 하버드 학생,교수들과 함께 공유하는 시간을 가집니다. 많은 참여 부탁드립니다. MMK+가 잠실 5단지 마스터플랜 2단계 지명공모에 참여건축가로 지명되었습니다. MMK+는 EMA 건축사사무소, FLO 건축사사무소 그리고 뉴욕의 조경사무소 SUPERMASS STUDIO 와 함께 팀을 이루어 조성룡도시건축, Christian de Portzamparc, 장윤규, Chris Van Dongen, 행림건축, 가아건축과 경쟁하게 되었습니다. MMK+ 가 강원도 삼척시와 대구건축문화연합에서 주최한 이사부 독도 기념공원 국제현상공모에서 3등을 차지하였습니다. 파일기초공사를 시작으로 노들섬 특화공간 조성사업의 본격적인 공사가 시작되었습니다. 약 16개월의 공사기간을 거쳐 2019년 봄에 준공이 예상됩니다. MMK+ is invited to the Seoul Biennale of Architecture and Urbanism "Imminent Commons" & UIA 2017 Seoul World Architects Congress. The Exhibits are currently displayed in Dongdaemun Design Plaza, Seoul Museum of Art and Seun Sangga. MMK+ 의 노들섬 프로젝트가 2017 서울도시건축 비엔날레와 UIA 서울 세계건축대회 전시회에 초대되었습니다. 현재 DDP, 서울 시립미술관, 세운상가에 관련 전시가 이루어지고 있습니다. MMK+ (Pilsoo Maing) is appointed as Public Architect of Seoul Metropolitan Government. MMK+ (맹필수 소장)이 2017년도 서울시 공공건축가로 선정이 되었습니다. MMK+ will lecture at Ddangzipsahyang, a open lecture series hosted by WIDE, sharing MMK+'s thoughts and stories on projects and running the office first time in Korea. MMK+가 제 122차 땅집사향 (땅과 집과 사람의 향기) 의 이야기 손님으로 초대되었습니다. 'MMK+의 서울 정착기' 라는 제목으로 뉴욕에서 서울로 넘어와서 정착하는 과정, 그리고 그간 진행해온 프로젝트를 소개하는 자리가 될 것입니다. 김지훈 소장이 건국대학교 건축학과 학생들을 대상으로 노들섬 프로젝트에 대한 프리젠테이션을 진행하였습니다. 건국대학교에서 하는 두번째 렉쳐로서, 노들섬의 역사와 당선안의 아이디어, 그리고 현재상황 등을 공유하는 시간을 가졌습니다. Pilsoo Maing, AIA presented Nodeul Dream Island Project to Vietnamese government officials. Hosted by KOICA (Korean International Cooperative Agency), the conference was held on waterfront development in Hue, a city in Central Vietnam, and MMK+'s Nodeul Island Project was chosen as one of the exemplary project. 맹필수 소장이 베트남 정부 관계자를 대상으로 노들섬 프로젝트에 대한 프리젠테이션을 진행하였습니다. 코이카 (KOICA)에서 주최한 이 컨퍼런스는 베트남 중부 도시인 HUE의 수변공간 개발 방향과 전망에 대한 것이었으며, MMK+의 노들섬 프로젝트가 좋은 예시로 선정었습니다. 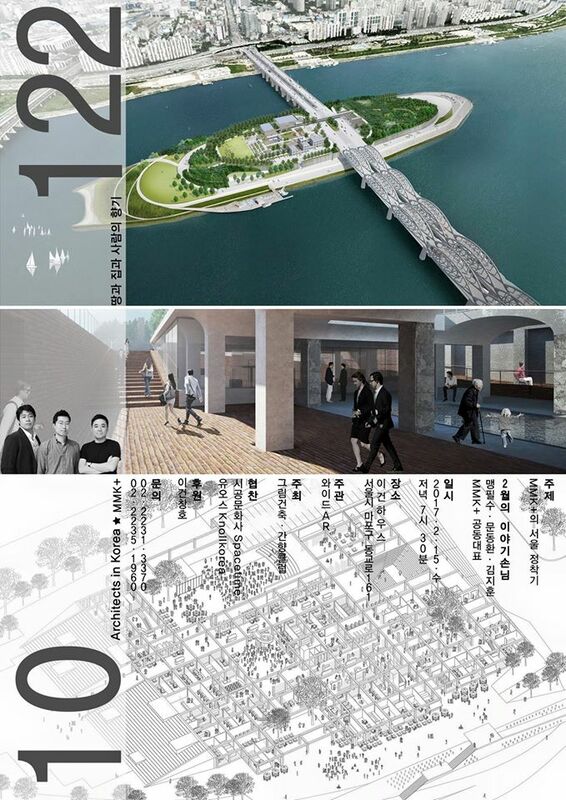 MMK+ Taehyung Park (Landscape Designer in New York) wins 1st prize for Nodeul Dream Island international competition hosted by Seoul Metropolitan Government. Nodeul Island is an abandoned artificial island for 40 years in Seoul, and MMK+ is commissioned by Seoul City as master architect for developing the whole island as a new music-centered cultural public space. Partnered with Topos Architects, an executive architect based in Seoul, MMK+ will be in charge of architectural design for the $43 million dollar project beginning August 2016. MMK+ 와 박태형 (조경디자이너)가 서울시 주최 노들꿈섬 시설조성 설계 국제 공모전에서 1등으로 당선되었습니다. 40년간 방치되었던 노들섬을 음악중심의 문화 공공 시설로 탈바꿈 시키는 이 프로젝트의 건축 설계와 섬 전체의 마스터플랜 설계를 맏게되었으며, Topos 건축사사무소와의 파트너쉽을 통해, 공사비 약 490억원의 프로젝트를 2016년 8월부터 진행하게 되었습니다.